After Star Wars: The Force Awakens came out, a controversy erupted over whether Daisy Ridley’s Rey was a “Mary Sue.” It was a largely sexist critique that branded the scavenger unrealistic because she was too talented too quickly. 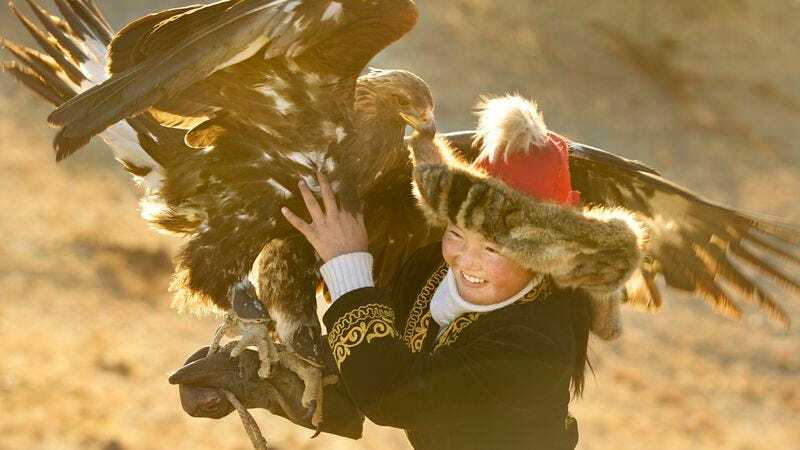 Those who registered that complaint might be surprised to learn that the documentary The Eagle Huntress chronicles a real-life heroine who easily masters her own Force-like skill without much strain. 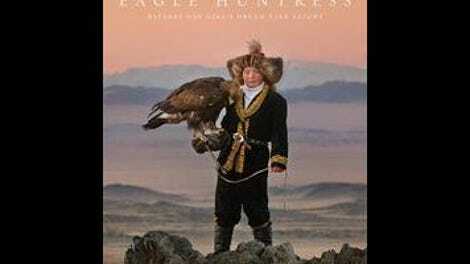 Her name is Aisholpan Nurgaiv, and she’s a Kazakh teenager who defies gender roles by becoming an eagle hunter. Powerful, driven, and gifted, she’s the kind of young woman who doesn’t flinch when a massive bird of prey swoops down to land on her outstretched arm. Director Otto Bell has found himself in awe-inspiring territory. Aisholpan is a remarkable person interacting with majestic creatures, surrounded by staggering natural beauty. It’s easy to become entranced. Still, the topography is relevant to Aisholpan’s quest. In one sequence, Bell shows how she must repel down a treacherous mountain to catch her very own eaglet. Perched on a ledge, she wraps the baby in a blanket, all while the mother is circling overhead, threatening to strike. It’s a moment laced with melancholy—Aisholpan’s triumph means that another creature loses her child. But Bell doesn’t focus on the lives of these animals when they aren’t associated with humans. Aisholpan is sweet toward the baby, stroking it and cooing to it like one might to a non-taloned pet that doesn’t eat raw meat straight off the bone. That relationship adds a tender layer to the proceedings, as does the one Aisholpan has with her beaming father, her biggest champion. Without demeaning his subject, Bell allows for some moments in which Aisholpan gets to be a normal kid. These interludes, however, still highlight her exceptionality. Before leaving for the competition, she paints her nails a bright shade—she just happens to do so next to an animal carcass. We also drop in briefly on her school life, on her laughing with friends in the dorms and aspiring to become a doctor. Every so often a group of skeptical elder eagle hunters pop up as talking heads to represent a backwards way of thinking. They don’t stand in Aisholpan’s way. Instead they hang themselves on their words. Women get too cold to eagle hunt? Well, there’s Aisholpan traversing frozen mountains in order to catch a fox. Perhaps more time could have been spent on the naysayers, or the lives of the actual creatures involved in this practice, or on the potential hardships of a nomadic life. But The Eagle Huntress isn’t critical. It wants to make your heart swell, and it does a fine job of it.